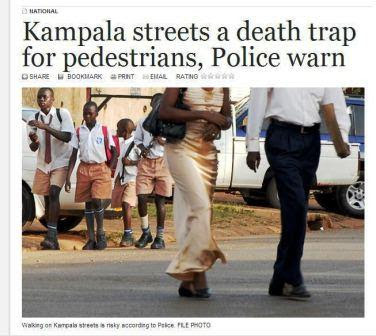 · What are the people in Uganda like? · What is the experience of living in Uganda? · How is Uganda handling the threats to the environment – climate change, deforestation, water pollution, sanitation, mining and oil extraction? 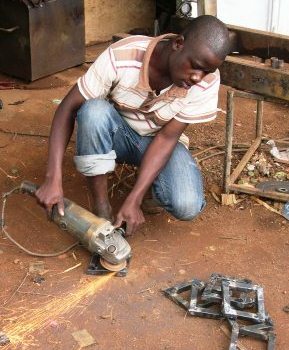 · How has Uganda progressed in the fifty years since independence? Kob in Murchinson Falls National Park, Uganda. The park straddles the Nile River, the world's longest that runs through ten countries: Burundi, Rwanda, Uganda, Tanzania, South Sudan, Sudan, Ethiopia, Kenya, Democratic Republic of the Congo, and Egypt. Uganda is home to many lakes and rivers including Victoria, the world's second largest freshwater lake. Uganda is a land blessed with a wonderful climate and abundant natural resources. The bounty of nature in Uganda was a delightful eye-opener to me. The weather is marvelous, warm sunny days, comfortable nights broken by rain showers. In most of Uganda plentiful rain keeps the countryside green all year round, ideal weather for growing a large variety of grain, vegetables and fruit. Native hardwood forests still survive in Uganda and the country is fortunate to have many large fresh water lakes that provide fish and water to local communities. The world’s largest river, the Nile, begins in Uganda and the country has magnificent areas for wildlife. While I could praise further the natural beauty and richness of Uganda, I am concerned about the destruction of this heritage that should be used to sustain future generations. Much of the hardwood forests have been cut down to make way for extensive agriculture including large scale sugar and oil palm plantations. Lake Victoria and many other lakes are being damaged by pollution from human, and industrial wastes as well as pesticides and fertilizers. Climate change poses a special risk to Uganda because the country is dependent on agriculture as a basis for its economy. Unpredictable rain from climate change could translate into the diminishment of agricultural production. There could be hunger where there was plenty. fabrication shop making brackets for a bedframe. The Ugandan citizens that I have met are hardworking, kind, entrepreneurial and ambitious. 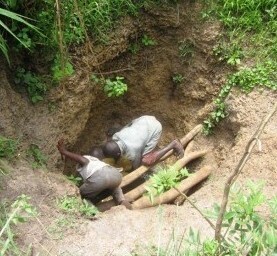 I can’t say enough about the spirit, inventiveness and determination of the Uganda people. As I walked each day along Entebbe Road from my home in SSeguku to the NAPE offices near the Zana circle, I saw young men fixing bicycles and boda-bodas using simple tools, workers welding doors and gates, women selling fruit and vegetables from small stands, men making chapatis and Rolexes over charcoal fires, workers handcrafting furniture. And I witnessed young children dressed in their school uniforms accompanied by older siblings and parents going off to school. These youngsters were polite and looked eager to learn. For Uganda to grow and prosper, hard work must be supported by education. This idea is echoed in the Swahili proverb, “Wealth, if you use it, comes to an end; learning, if you use it, increases.” Uganda has expanded public education with the Universal Primary Education act of 1997 when education at public cost became available for four children per family. My Uganda colleagues, however, voice concerns about the quality of public education and the need for more schools, and more better prepared and paid teachers. With a very young population – half of the population is 15 or younger – improving education should be, I believe, the country’s top priority to unlock economic progress. Because of Uganda’s low average yearly income, when I arrived in the country I expected to see many people struggling to make ends meet. But I was surprised to see expensive homes on the top of the Kampala’s hills and luxury cars on the streets. Figures, in fact, show that income inequality in Uganda rivals that of the United States. Uganda should not copy the US model of development that has led to an increasing gap between rich and poor. In Uganda the poorest 10% of the population receive just 2.3% of all income while the top 10% received over 36%. In the United States the figures are similar: the bottom 10% receive 2% of the income; the richest 10% take in 30%. In the USA, income inequality has increased markedly over the past two decades with most of the new wealth concentrated in the top 1% of the population. The United States, among the very richest countries in the world, now has many people who are homeless and many that do not receive proper medical care. Moreover, income inequality distorts the political process as the wealthy have the means to influence governmental action by funding the campaigns of political parties – both the Democrats and Republicans. If Uganda follows the US model of economic development, it faces the danger of replicating the problems that accompany it. Uganda at fifty is still a young country full of possibilities. Uganda citizens should use this anniversary to reflect on the kind of future that they wish for their children. My hope in the years to come, Uganda's natural resources will be protected, education will be supported and income inequality reduced. A study by theBrookings Institute tried to answer the question: Where is the Best Place to Invest $102,000 -- In Stocks, Bonds, or a College Degree? Well, my students don’t have that kind of money, but if you could borrow it, where would be the best place to invest? By comparing various investment alternatives since 1950 –stocks, corporate bonds, treasury bills, gold, housing, higher education, they came up with an answer which is …..a college degree. Yes, a college degree, over the long term, will result in greater income gain than any of the other alternatives. So, college is a good investment for the individual and for our country. And an associates degree leads the pack. However, this financial analysis leaves out an important difference between, for example, buying stock and going to college. The first requires money and patience for the stock to gain value. The second requires effort - studying, writing, researching, putting off other activities, cutting down on outside work. A student who goes to college invests in herself/himself by learning new skills and habits of thought. The decision to go to enroll in college is one of the most important in a young person's life. And the rewards of obtaining a degree will last a lifetime. From Joint Monitoring Program of the UNICEF/World Health Organization. 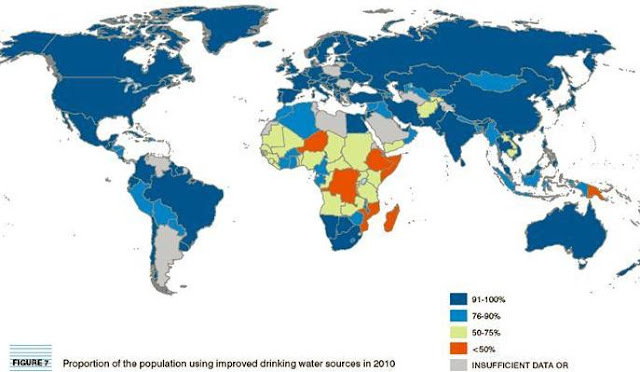 Africa stands out as the continent most lacking in improved water for its people. Safe water for drinking and cooking - vital for human life - is a critical problem in the developing world. The map above shows that fact - the lighter the color the greater the fraction of the country's population without safe water that is easily accessible. ( Easily accessible according to the World Health Organization means within 1 KM, 6/10 of a mile. One may still have to walk to get water by up to 20 minutes – each way.) Africa clearly is the continent most at risk and Uganda, close to the center of Africa, shares that fate. Throughout Uganda, many people carry water in large plastic jugs, often for long distances. In my neighborhood I observe each day children and women filling those jugs from a source of water that does not appear secure and safe. And every westerner who comes to Africa is told, “don’t drink the water – unless it is first boiled or is commercially bottled water”. 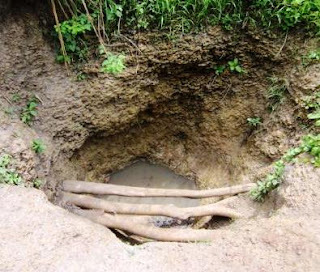 · Uganda has made progress toward its Millennium Development Goal of reducing by half the number of its citizens without “improved water” by 2015. However, recent figures show a reduction in the fraction of the population with improved water from 67% to 65%. Children getting water from the borehole. 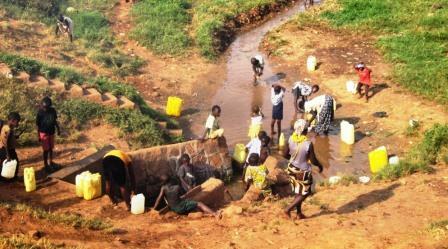 Children and women gather water from a water source in Nakawa-Kinawataka District, Kampala. The same water source from another angle. Traffic on Entebbe Road, - no place for pedestrians to walk. After my own small accident (see posting of September 8), I wanted to find out more about the level of injury and death due to vehicles both in Uganda and neighboring countries. The graphic below shows the rate of traffic deaths worldwide by country with the developing world and especially Africa with the highest rates (red on the map below). The US rate, by the way, is 13.9 which puts in above many European countries; Great Britain, for example has a rate of 4.8. The map above shows road traffic deaths per 100,000 people per year with the red countries having the highest rates (over 30) followed by green (over 20). Uganda's rate is 34.7. Source: Worldlifeexpectency.com -road traffic accidents. 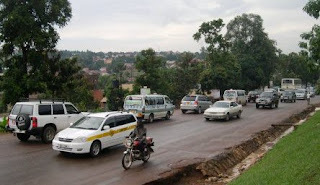 In Uganda there are multiple reasons for the high rate of death and injury on the roads: "Roads in developing countries often have mixed traffic, poor illumination, and sign posting, poor maintenance, and roadside hazards." 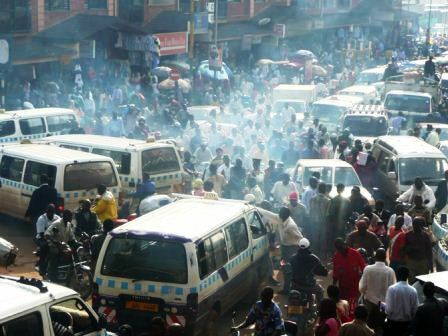 (African Health Science article) Another study looked at trauma cases in a Kampala hospital found that road traffic injuries were the greatest cause of trauma and that " pedestrians, especially children and adolescents, the most affected group". I leave with some pictures to get an idea of the conditions here. The taxi park in downtown Kampala, a destination point for many people taking public transit. From Kampala Daily Monitor, March 2, 2010. Full article. at this link. Each day I walk from my apartment to my place of work north along Entebbe Road, a major thoroughfare that links the airport in Entebbe to the center of Kampala. Unfortunately, my apartment is on the east side of the highway and the office on the west requiring me to cross two lanes of traffic. On Monday as the cars going north crawling along, bumper to bumper, I crossed the south lane during a break in the traffic, motioned with my left arm for a northbound car to let me pass, and walked quickly between two cars toward the shoulder. Just as I exited from between the line of cars, I was hit by a boda-boda (motorcycle) going north in the shoulder - what we would call a breakdown lane but it is hardly wide enough to be so classified. Luckily, the front tire of the motorcycle hit me square in the left hip. Shaken and bruised and still on my feet, two white clad women traffic cops appeared and began to lecturing the motor-cycle driver who was transporting a women passenger dressed smartly for work. One of the officers turned to me. “Are you hurt?”, she asked. “No, not seriously”, I replied assessing the state of my body. “Will you forgive this man?” the officer continued. Although this caught me off guard, I quickly realized that if I did not answer yes, the situation would become complicated. I also was aware of the overtones of the situation: a young African driver strikes an American pedestrian. Gathering myself, I answered yes, twice at the insistence of the officer. The motorcyclist, surely relieved, drove off with his passenger and I stopped to reach into my backpack for ibu-profen and water that I carry for emergencies. I tested my leg. Sore but able to walk, I went off to work, more aware than before about the dangers lurking along Entebbe Road. Of course, the situation is more hazardous for children and women, In my next post, I'll look more generally about the safety of pedestrians in East Africa. 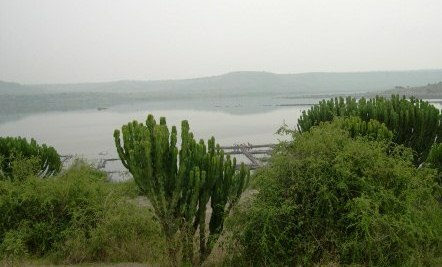 A view of Lake Katwe with salt pans in the near shore. Lake Katwe a unique ecosystem in Busongora, Western Region, Uganda near Lake Edward and the Queen Elizabeth National Park is endangered. The Lake, 3.5 square KM, is in a volcanic region in a bowl with no drainage. Due to the percolating water that seeps into the volcanic rocks, its water, over millennia, has become extremely salty with an estimated salt content of 13.5%. Since the 18th century, local residents have constructed “salt pans” to evaporate the trapped water and extract black salt that is sold for human consumption, animal feeds, and industrial purposes. 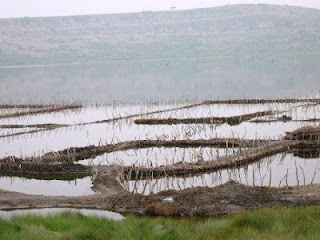 This activity that has shrunk the surface of Lake Katwe from 3.5 to 2.5 square kilometers has degraded the aquatic life of the Lake as well as severely damaging the shore line. Moreover, livestock grazing during this same period has destroyed much of the vegetation on Katwe’s steep banks resulting in erosion that deposited silt into the water further compromising the Lake’s ecosystem. 1) Involve local community members and local leaders to create a plan to restore the lake and to carry out this plan including providing the necessary labor. 2) Plant indigenous trees and shrubs on the steep banks of the Lake. 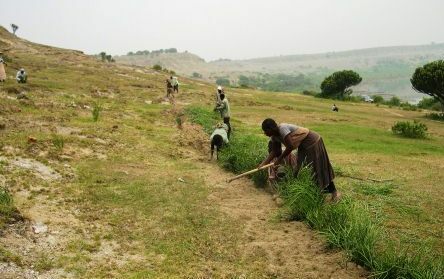 3) Halt erosion and restore the natural balance of the land by restoring trees and shrubs. 4) Restrict the grazing of animals on the lake banks. 5) Restrict the number of Salt Ponds by working with community leadership, district and town government. The long term goal is to preserve Lake Katwe while creating a sustainable salt industry. Without these efforts, environmentalists believe the Lake will be destroyed along with salt production. While difficulties remain, the first three steps of the plan are now being implemented. When I visited a few weeks ago, I observed 10 local residents planting indigenous trees Euphorbia tirucalli (finger Euphorbia) on the western slopes of the lake. This involved cutting small branches from existing trees, digging trenches perpendicular to the slope, placing the branches in the trenches and covering the base of the branches with dirt. The rains that will arrive in October will, it is expected, initiate growth of these plantings. In Uganda, a developing country, the efforts to save an environmental landmark, Lake Katwe should be admired.